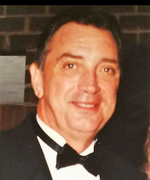 Kenneth Russell Floyd, 75, of Reisterstown passed away on January 27, 2018 at his home. He was born on March 20, 1942 in Kansas City, Missouri to the late Russell B. Floyd and Marguerite Floyd. He was married to Barbara (nee Maier) Floyd. Mr. Floyd was a house inspector with Baltimore County. He is survived by his wife, Barbara Floyd; son Corey Allen Haas of Pittsburgh, PA; daughter Kimberly Ann Wilson (Haas) of Parkton, MD; grandchildren Nicholas Haas, Griffin Wilson, Jeffrey Wilson, Erica Haas, Holly Wilson and Jarrod Wilson; 5 brothers and sisters of Missouri and California, April (Sunny) Wallace, Rick Floyd, Valerie Wiley, Kerry Floyd and Chris Whiting. Predeceased by sister Barbara Suter. Family will receive friends at the Eline Funeral Home, 11824 Reisterstown Road, Reisterstown, MD on Saturday 1:00pm to 2:00pm at which time a service will be held. Interment will be private.